It’s not the main focus of this article, but can serve as an overarching theme for the first portion. That theme being the lesser-known and even lesser-understood process that governs a team’s control over a young player. The Mets’ starting pitchers, Bartolo aside, are currently in this period of team control. An occasionally used practice on talented, young players by front offices is to guarantee money in exchange for extra years of possible team control. Whether it is this spring, this season, or in the coming years, some have hope that this tactic can be used to keep part of the Mets’ rotation together into the mid-2020s. In recent years you may recall the Mets and other teams waiting until a certain point of the season to call up their minor league stars. Matt Harvey, Zack Wheeler, Jacob DeGrom, Noah Syndergaard, and Steven Matz were all called up mid-season. Just this past year the Chicago Cubs claimed that Third Basemen, Kris Bryant, would start the year in AAA to work on his defense. Many around the baseball world speculated Bryant’s defense was a scapegoat to the actual reason… having him under control for an extra year. If the rules allow a team to keep a player in the minors for a brief portion of the season in exchange for a whole extra year of team control, why wouldn’t they? You can find two descriptive links on the system behind player control here at MLBTradeRumors and here at Baseball Prospectus. They’re informative, and were helpful to me in fully understanding the process so that I could break it down as simply and clearly as possible. Essentially, a team has control over a player until he has accumulated at least six years of major-league service time. Therefore, in the most simplistic scenario, a player debuting on Opening Day 2016, not ever being demoted to the minors after his call-up, would be fully controlled by his team for the 2016, 2017, 2018, 2019, 2020, and 2021 seasons. If the player doesn’t live up to expectations and the team feels he’s not worth keeping around, then at any point within those six years they can release him. But as long as he’s wanted, the team has absolute power over this player’s ownership. After the 2021 season, this player, if not signed to a contract extension, will become a free agent, able to sign with whomever he desires. How exactly a player gets paid prior to free agency is broken down as follows for the player described above. For the 2016, 2017, and 2018 seasons, he would be guaranteed the major-league minimum. In 2015, this was $507,500. On top of this, his team can include small bonuses based upon performance. A semi-in-depth look at how some teams work this process can be found here at MLBTradeRumors. Basically, this player is having a very small impact on his team’s salary obligations through his first three years. After 2018, this player becomes eligible for salary arbitration. How much he ultimately makes will be largely dependent upon his performance. During the offseason, both the player and his team submit salary figures for what they believe he should be paid. The salary negotiations can go to a third-party arbiter who will decide the player’s salary, or, before it gets to this point, the player and team can come together on a mid-way point between themselves and agree on a one-year contract. Over the next two offseasons, following 2019 and 2020, as long as this player’s performance improves, or at least remains consistent, his arbitration-based salary will most assuredly increase each year. To clarify and give some examples as to what arbitration-year salaries can look like, Matt Harvey just received a one-year, $4.325 million contract after coming off of a great, post-Tommy-John campaign, in his first arbitration-eligible offseason. Likewise, following his first arbitration-eligible offseason Dallas Keuchel will be making $7.25 million, a bit more than Harvey after winning the AL Cy Young. On the opposite end of the spectrum, the 2014-15 offseason was David Price’s final year of arbitration eligibility. Price, coming off of a very good year, and widely known as one of the most consistently great pitchers in the game, received a record-setting, arbitration-eligible salary of $19.75 million! for the 2015 season. If a player is called up mid-season it makes everything slightly trickier. This is when a rule known as “Super Two” comes into play. To be technical for a bit, a full year of service time is defined as 172 days on a major-league roster. As seen in the above example, after three years of major-league service a player becomes arbitration eligible. Each offseason however, additional players with fewer than three years of service can become arbitration eligible as well. The Super Two rule states that the top 22 percent of players (in terms of service time) with greater than two years, but fewer than three years of service also become arbitration eligible. When a player is first called up, it is unclear when exactly this Super Two date will fall; but by looking at past Super Two service time requirements, teams can estimate when this should be. I will list past Super Two eligibility requirements below. Take note that if a number reads 2.145, this means two years and 145 days. The number following the decimal, 145, represents days, not thousandths of a year. Therefore, following the 2015 season a player with at least two years and 130 days of ML service time became arbitration eligible. Let’s take Noah Syndergaard for this example. Over the course of 2015, he accrued 149 days of service. Based on past years’ Super Two cutoffs, it seems very possible that Syndergaard could acquire this status. That would mean instead of being arbitration eligible after the 2018 season, he will have a total of four arbitration seasons beginning after 2017. Conceivably, this is not a major issue. The only problem is money-related as arbitration salaries for good players are much more than the league minimum. In an extreme scenario, it could cost the Mets $15 to $20 million over the course of four years. Arbitration years happen. Now what? A player can become a free agent after he has completed six years of major league service. There is no quirky rule here like Super Two. Any player not extended or resigned by his original team with at least 6.000 years of service time will become a free agent. Similar to arbitration eligibility, this can be manipulated as well. We’ll bring back Kris Bryant. The Cubs strategically waited until there were 171 days of the season left (remember 172 constitutes a full year) before calling up Bryant. Therefore, as of right now he has .171 years (171 days) of service time, one day short of 1.000 years. Bryant will now get to play 2021 in a Cubs uniform if the team desires, and all he had to do was miss the first 10 games of the season. If Bryant had begun the year with the Cubs, he could have become a free agent after 2020. Combining everything talked about so far, here is a very simplistic breakdown of how players called up in 2016 will be controlled over the beginnings of their careers. Truthfully, its a rather convoluted process, and a lot goes into what is described throughout this article. There is chatter of doing away with or altering this system so that teams aren’t motivated to manipulate the service time rules. I imagine at some point in the future, these rules, and this article will become archaic. 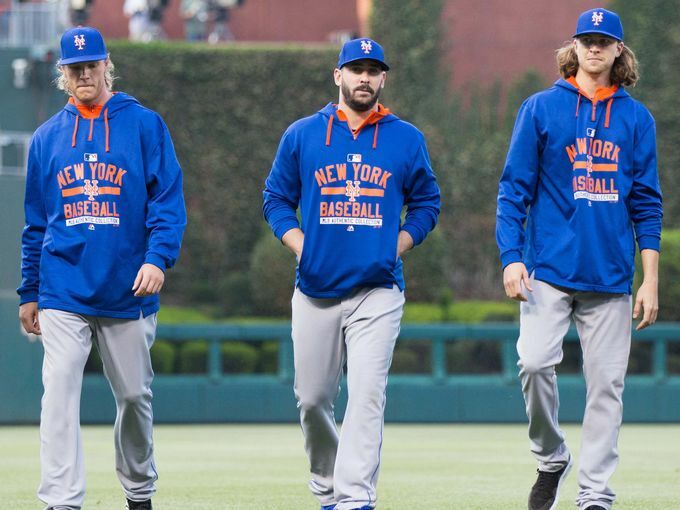 However, it stands for now, and will govern the future of the Mets’ pitching staff. DeGrom, Harvey, Wheeler, Matz, Syndergaard, and even Familia, have all had their service time delayed enough to push free agency back a year. All except for possibly Syndergaard will likely avoid Super Two status, and save the Mets a bit of money. But now, as there has been talk of, the Mets have the opportunity to pounce on extensions, and possibly preserve their (so far) dominant rotation for years to come. Tomorrow I will break down how these extensions work by giving recent examples of pitchers who signed them, and look at who compares most favorably to members of the Mets’ staff. 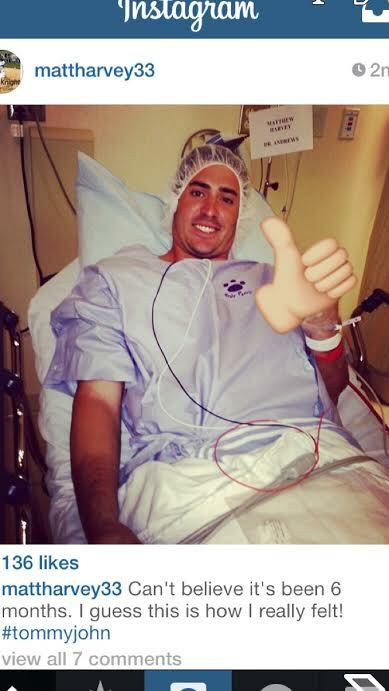 Photo credit to USA Today, MLB.com, and my phone via the limitless graveyard of deleted Matt Harvey social media posts, specifically his Instagram, mattharvey33. Well written article, looking forward to more. Follow back.